On Wednesday, the extremist Daesh (ISIS, ISIL) group, known for its brutal beheadings and mass murder, took over the Yarmouk Palestinian refugee camp inside Damascus city limits. Palestinian women and Christians and male secularists are at special risk now. Had they been living normally in their homes in what is now Israel, with their own state, they would not have been left vulnerable to this fate. Refugees and stateless people not only have no courts or armies to defend their rights, they are not even recognized as having the right to have rights. The Israelis ethnically cleansed three fifths of the Palestinians of British Mandate Palestine in 1947-48, creating enormous refugee crises in the West Bank, Gaza, Jordan, Syria and Lebanon that roiled the region through the subsequent decades and continue to contribute to instability in the region. Some 70% of the Palestinians cooped up by the Israelis in the open-door concentration camp called Gaza are descendants of refugee families from what is now Israel, some living only an hour’s walk from the homes that were stolen from them. Some 40% of Palestinians in Gaza are still living in refugee camps, despite Israeli direct rule 1967-2005, which propagandists say was benevolent– but clearly it left Palestinians with blighted lives. Propagandists who excuse the ethnic cleansing campaign and the continued explicit denial to Palestinians of the right of citizenship in a state often maintain that it should have been possible for “the Arabs” to “absorb” the Palestinians. But in international law, the state that committed the ethnic cleansing is responsible for it and for reparations, not the hapless neighbors on whom the refugees were unceremoniously dumped. Moreover, the right wing Israeli construction of “the Arabs” is intended to deny specific Palestinian political identity and to create all the hundreds of millions of speakers of the Arabic language as an undifferentiated mass, as a way of making that mass responsible for absorbing the people on whom Israelis inflicted a tort. As for “Arabs,” they include the Christians of Lebanon, who rejected Lebanese citizenship for Muslim Palestinians because it would change the politics of that country. It should be remembered that most Palestinians also reject ‘tawtin,’ being given citizenship that would preclude their claim on Palestinian identity or the right to return to their homeland. The Palestinians expelled by Israelis to Syria are a case in point. They have grown through natural increase to some 400,000 (Syria’s population is 23 million). Many of these Palestinians still live in 9 large refugee camps. Among the more prominent is Yarmouk, a camp that had until recently come to have 160,000 residents and now has only about 18,000. Palestinians are not Syrians and do not have Syrian citizenship, but they were given substantial rights as residents in Syria. None of that means anything now that the Syrian state is in collapse. 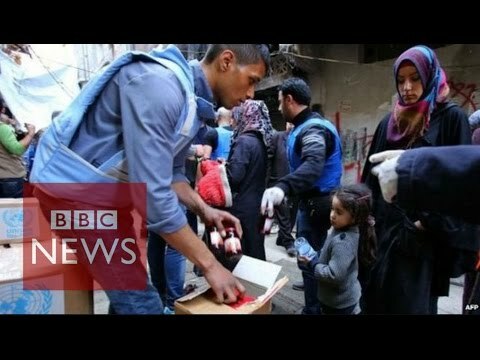 Some 90 percent of the population of Yarmouk has fled, caught in the cross-fire of the civil war. The fighting presented a dilemma to Palestinians themselves with the leftist Popular Front for the Liberation of Palestine General Command (PFLP-GC) siding with the regime and the Storm Brigade (Liwa’ al-`Asifa) siding with the secular rebel group of some years ago, the Free Syrian Army. Now leftists and secularists and democrats are all gone, along with tens of thousands of refugees made refugees all over again. Indeed, this is a common fate of the stateless, since their basic human rights are unstable and often denied, so that even when they build up a little island of prosperity, it is often abruptly taken back away. Does it mean anything for the displaced Palestinian victims of the Israelis that they are “Arabs” among Daesh murderers? Where is the Palestinian army that would rescue them (the West Bank isn’t far away)? Palestinians continue to suffer, not only under Israeli military occupation, but wherever they are stateless refugees, open to the cruel turns of fate that beset the powerless.